Hawai’i Symphony concertmaster Ignace Jang with pianist, UH professor Jonathan Korth. 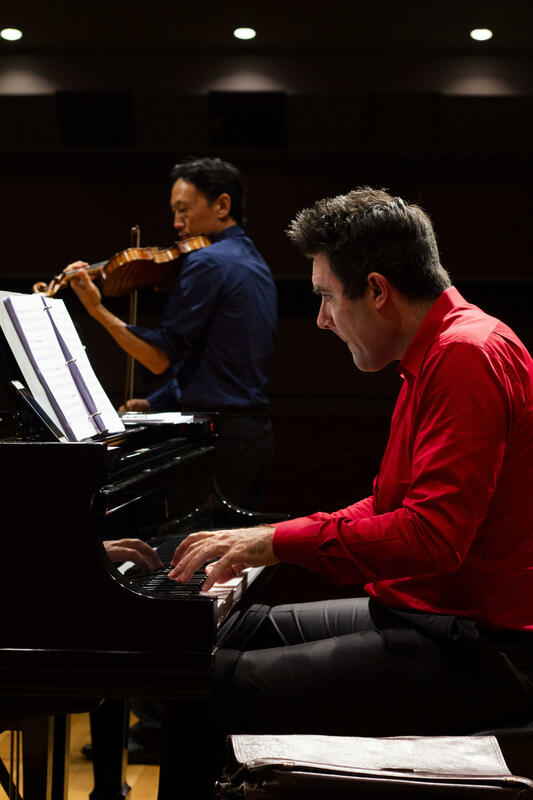 Both will be performing in the Hawai'i Chamber Music Festival's upcoming holiday series. Korth is also president of the Honolulu Chamber Music Series, which presents concerts by nationally and internationally renown players. Clearly, there is no competition among chamber music purveyors in this town. 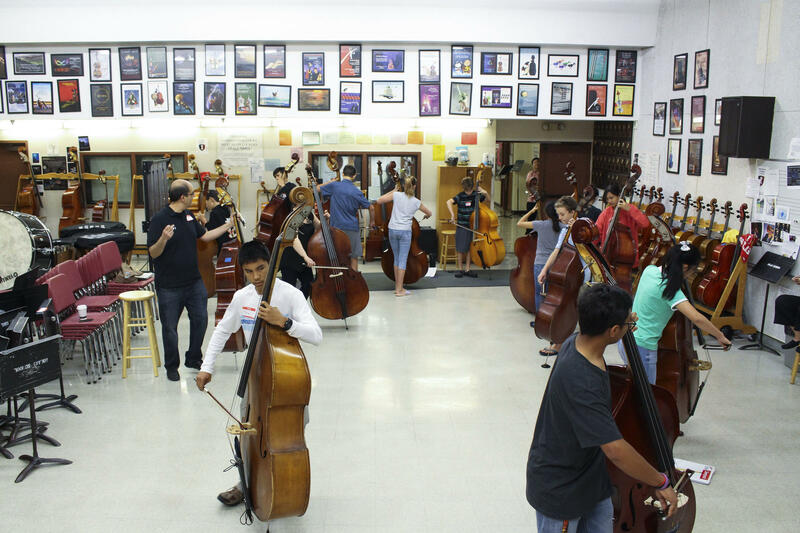 It's all part of the program in one of the Hawaii Chamber Music Festival's workshops for young bassists. One of the greatest services a local organization can provide is access to experts and opportunities. When fine classical musicians come to town, their sponsoring organizations, like HCMF, often offer master classes, demonstrations and opportunities to interact. The Hawai‘i Chamber Music Festival's holiday series includes an Evening with Eric Silberger and Jonathan Korth, Tuesday, December 18, 2018, at Orvis Auditorium. Internationally acclaimed violinist Robert McDuffie knows it can be a cold cruel world for classical musicians. That’s why he built entrepreneurship into the program at his Center for Strings at Mercer University. ‘Iolani grad, bass player, Christopher Yick is there, soaking it up, and says he benefitted from so many classical music experiences in Hawai‘i growing up. Yick: Now that I’m in college I really wanted to create something that would be artistically fulfilling but also significant to the community as well. A junior at the Center for Strings, Yick launched the Hawai‘i Chamber Music Festival in January when Robert McDuffie was in town performing with the Hawai‘i Symphony. In May, HCMF did a benefit chamber concert for Kaua‘i flood victims, in August, a dinner for the Salvation Army. Coming up in the four concert Holiday series, an evening paired with luscious desserts will benefit a mentorship non-profit, Common Grace. Tchaikovsky prize-winning violinist Eric Silberger plans to perform Waxman’s Carmen Fantasy, with pianist-on-fire, Jonathan Korth. Expect to feel something. Silberger, who has won praise for his virtuosic performances, co-founded the Hawai‘i International Music Festival in the last year or so. Seeing all these classical music festival and series people getting together is a good sign. Silberger delivered live wire performances with the JP Jofre Hard Tango Chamber Band in Honolulu not too long ago. In adddition to community performances at Palolo Chinese Home and American Renaissance Academy in Kapolei, HCMF plans a special evening of music and sweet treats on December 27th, 2018, at Kaimukī Christian Church. Chris Yick will play Rossini’s Duet for Cello and Bass with cellist Josh Nakazawa, who has been performing recently with Jake Shimabukuro. Yick: It starts out in the practice room obviously. I think all musicians can relate. When we’re learning a piece, we want to be able to bring justice to the piece. For me, I like to give 110% when I’m practicing and just in the moment of performing, the connections we make, and how conversational it can be. Especially in something as fascinating as the Rossini duet, that’s when I really feel like we’re bringing this piece to light and we’re hoping audience members can see that as well. Chamber concerts are not about crowds, they’re about listening, and communing through sound. If you've never attended a classical music event, try starting with a chamber concert like the December 18, 2018, Silberger/Korth match up. Painter Lynda Hess discovered clay recently, and while she was working, she thought about the Biblical origins of men and women. This idea developed, becoming her new installation at the HiSAM Gallery x MORI Shop in the Hawai‘i State Art Museum.